Christmas is a joyful time of year that is filled with twinkling lights, beautiful Christmas ornaments, tasty cookies, and a general feeling of good will towards all men. However, Christmas is not always easy for families who struggle every day just to put food on the table. The financial and emotional stress that can come with buying gifts, decorating the tree with beautiful Christmas ornaments, and preparing a delicious Christmas meal are difficult for most families, but it is even more stressful for those who have very little to begin with. I know this first hand because I had the opportunity to spend Christmas one year with a family that struggled every day for just the mere necessities of life, but Christmas has a way of bringing out the best in people and it can be a special holiday for even those who have very little to begin with. I met the Ramos family when I spent a year living in Peru as an exchange student. Peru is a beautiful country with lush greenery and warm, smiling faces all around. While I lived with a different family as part of my exchange program, I became close friends with a classmate of mine named Catalina Ramos and I spent much of the holiday season with her. The family I was living with in Peru was fairly well off, by Peruvian standards, but the Ramos family was struggling on a day to day basis. However, I enjoyed spending most of my time in her home around the holidays because they seemed to make the most out of their situation and as a result it turned out to be one of the best Christmases I have ever experienced. Unlike much of the United States, it is very warm during the month of December in Peru because it is actually the beginning of summer. This does not seem to matter, however, because they still do many of the same things that we do in the United States no matter how hot it gets. For instance, Peruvians love to decorate their homes with beautiful Christmas ornaments and even decorate a tree with ornaments, just like we do. Families who can afford it will buy a large Christmas tree and expensive ceramic or glass ornaments to decorate it with, but those who cannot will cut down their own tree and make their own handmade Christmas ornaments. While my exchange family was able to buy a beautiful tall Christmas tree my friend Catalina was not so fortunate, however it did not take away from the joy of the season one bit. In fact, it seemed to make it even better because the whole family would get together to make their own ornaments, decorations, and presents. In the week before Christmas, I helped Catalina and her family make the many fun and beautiful Christmas ornaments they enjoyed creating out of inexpensive or found items. One of the most interesting and beautiful Christmas ornaments that we made were made out of dried gourds. Gourds are indigenous to Peru and have been decorated by the Indian people of the Andes for over 2000 years. Today, they are painted, carved, and burned into a variety of different shapes and sizes and used as Christmas ornaments. Tourists and those who can afford them can buy decorated gourds in the markets, but we just used paint to decorate our own gourd Christmas ornaments that year. We also sewed together fabric Christmas ornaments and decorated them with beautiful hand-dyed threads. Using scrap pieces of black fabric that had been saved over the year from other sewing projects, Catalina showed me how to make beautiful, yet simple fabric Christmas ornaments. We cut out two small squares of fabric and then took the different colored threads to sew geometric designs on them. I made one with different squares of red, green, white, and gold. We then hand sewed the squares together and filled them with rice, beans, cotton balls, or whatever else was lying around that could be used for stuffing. We attached a ribbon to one of the corners as an ornament hanger and hung them on the tree like beautiful little fabric diamonds. I still have my first fabric ornament that I made that year and now I make them for all of my friends each Christmas. One of the most important activities that come with celebrating Christmas in Peru is to display your nativity scene in the home, outside, or around the churches. Peruvians are devoted Catholics and the Christmas season is always focused on Jesus and the story of his birth. 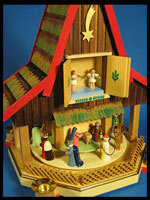 It is a tradition for most Peruvian families to make a visit to the market on December 24th to purchase a new figurine to add to their nativity scene. One of the most famous markets, Santurantikuy, which means the buying of saints, sells everything from very expensive ceramic nativity figurines to inexpensive handmade Christmas ornaments. The Ramos family did own a nativity set that had been handed down for several generations, but they were not usually able to buy new figurines to add to their set each year. Fortunately, due to the giving nature of the Peruvian people, the church would put on what they called chocolatadas where the wealthier families would donate new Christmas decorations, nativity figurines, small gifts, candies, and cups of hot cocoa for the poor children of the community. It was an interesting experience for me because my exchange family went to the festival to donate gifts, while Catalina and her family went to accept the gifts. Because my exchange family knew how poor the Ramos family was, they gave them a special gift of new nativity figurines to add to their existing set. The evening of December 24th, or Noche Buena, is when Peruvians have their largest Christmas celebrations. Family and friends all gather together to eat, drink, dance, laugh, and open gifts that Santa Claus has brought. Guests will usually bring cakes, fruit, or beautiful Christmas ornaments to add to the host family Christmas tree. My exchange family hosted a Christmas party that year and Catalina and her family came over to join in the celebration. While they were unable to buy an expensive gift for my exchange family, they did bring the most beautiful handmade Christmas ornaments that were made of llama wool and appliquéd with a variety of different Christmas scenes. Mrs. Ramos hand made them all herself and everyone commented on how beautiful her artwork was. That Christmas night we lit fireworks, ate turkey, and danced the night away until the wee hours of the morning. It was one of the best Christmases I had ever experienced because it did not matter how much or how little you had, but what was in your heart that mattered. The rich and the poor all worked together to make Christmas special for everyone in the family, especially for the children. I was amazed at how the Ramos family found such joy in making their own Christmas ornaments and how the true meaning of Christmas was alive and well, even in this tiny Spanish community. I will treasure the Christmas ornaments I made that year and will hold the memories of my Christmas in Peru in my heart forever. Rich or poor, North American or South American, Christmas is truly a time of year that brings joy to everyone.